Sandy Richards is an award-winning author of A Far Cry…From Home and “Grammy” to a gaggle of six on-the-move grandchildren. She is a graduate of the Institute of Children’s Literature and a member of SCBWI. Ballroom dancer, Elvis enthusiast, and avid reader, Sandy shares these varied interests with her grandchildren…every chance she gets. Sandy lives in Commerce, MI with her husband, Joe. For more information, visit her website at www.sandy-richards.com. Grammy Do... is a children's picture book written by Sandy Richards and illustrated by Lori Hohmann. Both the author and the artist are grandmothers, and Hohmann uses their grandchildren as the models for the panels in this book. What is a Grammy? Richards' story gives the answer by answering a number of questions about what a Grammy does. There are any number of things she delights in, from taking her grandchildren by the hand at street crossings to pushing an enthusiastic child on a swing. Hohmann's illustrations bring each of these simple, yet endearing, acts of love to life. Her ink and wash sketches are gorgeous and each one merits a frame for hanging in a child's bedroom. Her faces are beautifully rendered and show a wide variety of expressions, from the impish grin of delight on a little girl jumping in a puddle to the transported face of a young thespian rapt in a performance. Sandy Richards dedicated her children's picture book Grammy Do... to three grandmothers who made a big difference in her life, and her book passes on that loving tribute perfectly. Richards' and Hohmann's work meshes seamlessly as they illustrate the instinctive and loving relationship that is universally shared by grandmothers and grandchildren. There is a spirit of simple joy that emanates from this work that is quite infectious. This is a grand story time read for grandparents and parents to share with their children, as well as being an excellent primer for new readers. I'm thinking, however, that any prospective grandmother would also be thrilled to receive this book, along with the news of a grandchild on the way. Grammy Do... is most highly recommended. Who loves to read stories to their precious grandchildren? Grammy Do! 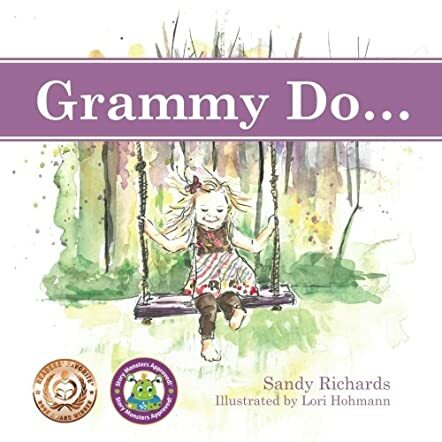 Sandy Richards has written this adorable story, Grammy Do... that celebrates the special relationship between Grandmas and their cherished Granddarlings. The book begins with the cutest of rhymes and follows that pattern all the way through. With each turn of the page, a delightful question is asked, and 'Grammy Do' is always the right answer! Between the covers you'll experience touching moments, tender scenes, and lots of smiles and giggles. You'll find each season of the year on display here, not necessarily in order, but it gives the book a smooth, random flow. By the end of the book, Grandmas and Grandkiddos alike will feel the joy of the loving message portrayed in this work of heart. As a Grandma to four granddaughters (and another little one on the way), I'm always on the lookout for a good Grandma book. A book that is filled with catchy phrases, loving sentiments, and beautiful pictures. Grammy Do... has all that and more. The illustrations are beyond amazing, really showing the playful nature of the overall theme and bringing the 'characters' to life. One of my favorite things about the book is how Sandy Richards has personalized the book by using herself and her own grandchildren as the book's characters. Plus Grammy Do... gets bonus points for the fun rhyming style that kids of all ages will love. This would make the perfect gift for any grandma or grandma to be! Who is there to wipe away your tears when you cry? Who is it that puts a twinkle in your eyes? Grandma can. Grammy Do... by Sandy Richards is a beautifully illustrated children’s book that a child will enjoy reading over and over again. In reading Grammy Do... you will feel the connection between the child and their grandmother. Grammy Do... tells the personal story in rhyme of author Sandy Richards and illustrator Lori Hohmann’s adventures in being grandmothers. Grammy Do... shows the essence of fun and enlightenment that they feel in being a grandmother. To a child, their grandmother is their best friend. Children can feel the unconditional love, warmth, comfort and compassion that only a grandmother can give as told by Sandy Richards and illustrated by Lori Hohmann. As I read Grammy Do... I saw the story not only through the eyes of Sandy Richards and Lori Hohmann, but also through the eyes of a child. In Grammy Do... you will see that special bond between the child and their grandmother. Grandmothers are so special because they allow the child to do things that their parents otherwise wouldn't allow them to do. The grandmother will always hold a special place in the heart of a child, even when the child becomes an adult. It's those warm cookies, cold milk, and other special memories that make a grandmother so special. In Grammy Do... you will be taken back to those precious moments with your grandmother.